From the time you’re born to adulthood, your body does a lot of growing. Your feet, naturally, grow along with you and support you as you learn to walk, play, and be active. Having a healthy foundation as a child can help you prevent painful problems in the long run, which is why taking care of children’s feet is so important. Feet that develop correctly are able to absorb shock, distribute your body weight, and push off the ground efficiently. Even when problems occur, children’s feet heal quickly and are more likely to respond to conservative treatments. Pediatric foot care can help monitor normal growth and head off potential biomechanical injuries before they get out of control and cause problems later. Early feet are flexible and shaped differently from an adult’s lower limbs. The supporting muscles and connective tissues are also undeveloped. Kicking, wiggling, playing, and walking without shoes all strengthen baby feet so that they’re able to support weight and footsteps. During this stage, it’s best to let your child play, crawl, and walk around indoors in either bare feet or just socks. When he or she does wear shoes, they should be soft-soled and flexible. Footwear with solid, protective soles are better for older children who run around outdoors a lot. As your little one gets older, his or her foot bones harden, the muscles strengthen, and the tendons and ligaments become more stable. Your child’s walking and running becomes more coordinated. By school age, your child’s arches should be mostly formed and the toes straight. The bones will continue to grow and get larger into the teen years, when the growth plates will close and the feet will stay roughly the same size. You do need to watch young children’s feet for common congenital and early development issues. Clubfoot and intoeing from metatarsus adductus are noticeable at birth, but other intoeing or out-toeing isn’t usually apparent until your child begins walking. Toe-walking may signal Achilles tendons that are too short. Ingrown toenails may appear, too, particularly if a baby or child’s socks or shoes don’t fit well. 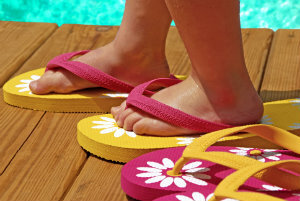 Having flat feet is common, since children don’t develop arches until they walk more and their feet grow. This isn’t usually a problem unless it causes pain. If it does, you child will need some care to manage the discomfort and control the biomechanical issue to prevent injuries. Bunions, although less common, are sometimes also a concern. You need to watch your child’s feet for infections, as well. Problems like athlete’s foot and fungal nails are contagious and easy to catch when your child runs around barefoot. Plantar warts are skin growths caused by viruses lingering in the environment, too. Good pediatric foot care catches these problems early so they can be cared for while they’re easy to manage. Active kids build up their lower limbs’ strength and stability, but the hard pounding in sports also puts feet and ankles at risk for painful injuries. Both overuse and traumatic injuries can happen in kids and teens. Over-training without proper conditioning, or wearing poor footwear, can cause a lot of issues. Heel pain from Sever’s disease is one of the most common results, though conditions like tendonitis, shin splints, and stress fractures occur regularly as well. Most of these are avoidable problems with appropriate pediatric foot care. Sometimes accidents can’t be avoided, though, especially in sports. Sprained ankles, fractures, and turf toe are among the painful problems that can sideline your child for a time. The right care, however, can restore your son or daughter’s lower limbs to full strength. That way he or she can get back in the game and hopefully prevent future injuries. Investing in your son or daughter’s feet now is investing in their future health and comfort. Let Absolute Foot Care Specialists in Las Vegas help you manage your children’s feet and your whole family’s lower limb health. You can contact us for more information, or make an appointment with us by using the web request form or calling (702) 839-2010.